Large Vintage Cream Dresser Display CabinetDimensions:H230 x W175 x D46 cmMaterial:Mahogany + MDFPac.. 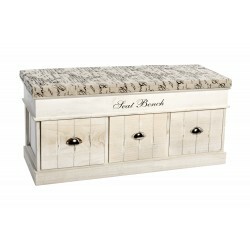 This white wooden storage bench comes with 3 pull out drawers with rope handles and an opening top. .. Solid wood storage bench with two opening cabinet doors and a shelf. Also comes with a soft grey cus.. This white wooden storage bench comes with four wicker baskets and a soft striped cushion on top of ..